The Ireland-Palestine Solidarity Campaign has learned that Galway-based Irish chef JP McMahon, who was scheduled to take part in an Israeli Foreign Ministry-sponsored event in Tel Aviv this November, has withdrawn his participation. McMahon, along with several other international chefs, was due to attend ‘AMEX Round Tables’, an elite culinary festival sponsored by American Express, Dan Hotels and others, including the Israeli Foreign Ministry which flies top chefs to Israel for the event to ‘gastro-wash’ Israel’s image – the aim being to divert attention from its colonial occupation of Palestine and the apartheid regime it forces the Palestinian people to live under. Responding to a query from a concerned member of the public in an email seen by the IPSC, a representative of McMahon’s restaurant Anair confirmed that “JP [McMahon] was invited to attend however due to other work commitments we have had to decline.” At the time of writing, however, Mr. McMahon remains listed (cached) as a participant on the official AMEX Round Tables website. 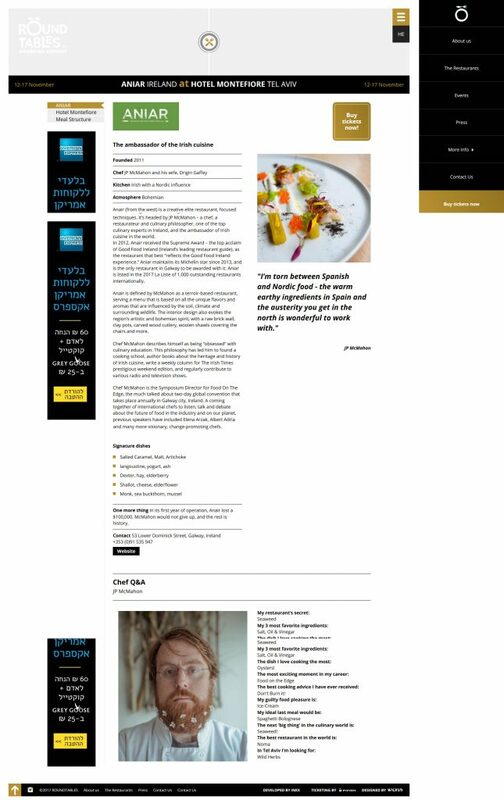 While not citing the BDS campaign as the reason for the cancellation, it would appear that – following the well-publicised BDS Movement campaign asking people to contact the international chefs scheduled to take part – Mr. McMahon realised what a culinary disaster it would have been to associate his good name and renowned restaurant with the poisonously distasteful ‘Brand Israel’ campaign cooked up by the Israeli state. Brand Israel, in the words of the Foreign Ministry’s top official Nissim Ben-Shitrit, promotes “culture as a propaganda tool of the first rank” and “[does] not differentiate between propaganda and culture”. 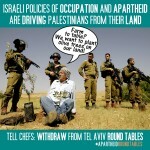 This campaign seeks to promote an image of the Israeli state as a peace loving, vibrant, liberal democracy, totally at odds with its violent and racist reality – a reality that frequently sees Palestinian culture violently repressed, not to mention the cultural theft of traditional indigenous Palestinian recipes and foods which are promoted to the world as being ‘Israeli’. A major facet of this campaign is bringing people on managed trips to Israel where they are not shown the reality of life for Palestinians living under one of the world’s longest standing military occupations. Recent Ireland-based guests of such trips include photographer Peter Vargas of ‘Humans of Dublin’ who was brought to Tel Aviv over by Vibe Israel, whose self-declared aim is to “strengthen Israel’s brand in the world”, and street artist MASER who was a guest of the Haifa Walls Festival (we can only guess there is no irony intended here). It is worth noting that Haifa – a so-called mixed city, where 10% of the population are Palestinian citizens of Israel – was largely ethnically cleansed of its indigenous Palestinian population by Zionist colonial paramilitaries in 1948; of 61,000 Arabs who lived there, only 3,500 managed to escape expulsion.